Hotel Jonic Mazzarò, Taormina. 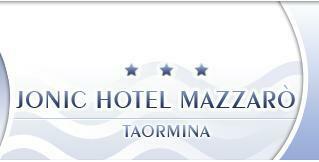 Jonic Mazzarò Hotel Taormina. The Jonic Hotel Mazzarò is a small and romantic residence in Liberty style located in the heart of the Mazzarò Bay, near Taormina; it is at only 30 metres away from the funicular station which links Mazzarò to the centre of Taormina and it enjoys a really privileged position, from which it is possible to go at the discover of the beauties of Sicily. Run by generations of the same family, the hotel, in spite of the recent refurbishing, has kept in the time its original style, characterized by arches on the facade and large internal rooms. It offers a wide range of services, among which a restaurant, a breakfast room, a bar, a TV room, a suggestive panoramic terrace, different comfortable rooms, the reception open 24 hours per day and a comfortable parking. The structure is small but cared and it places at its guests disposal all the comforts of a3-star hotel, keeping an excellent quality-price ratio.